This small box game packs a LOT of variability in. With 3 variations on the setup, randomly generated walls, 2 versions of each character, and loads of event, loot, and tool cards, no 2 games are the same. Like many similar games, each player has a unique character and ability. 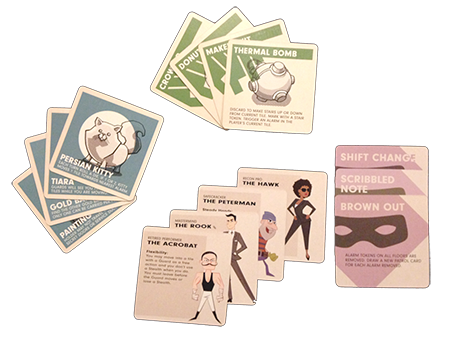 The hacker can avoid tripping alarms, the acrobat can move between floors via the windows, and the peterman gets a bonus die for safecracking. With 9 characters in all, you may not quite be Ocean’s Eleven, but George Clooney and Brad Pitt never had a psychic or a falconer on their crew. Players move through the building, peeking at neighboring tiles, or deciding to gamble and move blindly into them, risking a variety of consequences. Beyond alarms, would-be thieves find locked doors, a bathroom full of stalls to hide in, precarious walkways that can trigger a fall, and more. When a safe is located, players add and roll dice, attempting to crack the safe by rolling numbers determined by other tiles on the floor. After each turn, a guard moves. Each guard utilizes a deck of cards identifying their destination. They move toward the destination at a speed determined by the floor they are on, and the amount of mischief the players have caused. Get caught by a guard and you lose one of 3 stealth tokens that represent your luck and skill at hiding. Alarms will cause a guard to head straight to the offending player’s location, which may sound terrible, but can be used to create distractions and save your friends. Successfully crack a safe and you are rewarded with a tool ranging from dynamite to roller skates. Players also receive loot, which is often more of a burden (think large paintings or heavy gold bars). Once all safes have been cracked, the players move to the roof to escape with the loot. This game has been a major hit with everyone I have introduced it to. I can tell because most of them are now proud Burgle Bros owners. The theme is strong and backed by effective mechanics. It manages to capture the flavor and tension of a heist while inserting levity through the events, tools and loot. Each game creates a story, and my family and friends fondly remember the game where we blew a hole in the ceiling to escape, or that time we kept losing the cat that someone thought to put in the safe as loot. 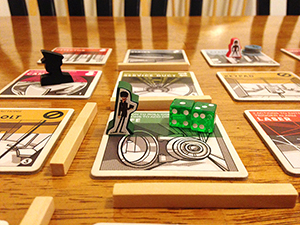 Like many cooperative games, Burgle Bros can be vulnerable to what some call “quarterbacking” or when an experienced player tells everyone else what moves to make. I have found this to be less of a problem at my table, especially since the guards are constantly moving and players often find themselves on different floors with different challenges to address. 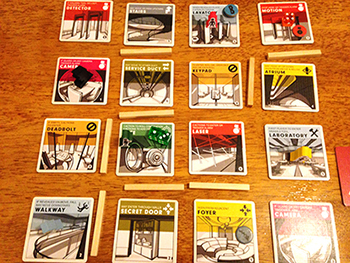 I find Burgle Bros to have a stronger theme than Pandemic or Forbidden Island/Desert. The tile exploring and variable player powers may feel familiar to Forbidden Desert fans but I have not found anything quite like the guard movement. If you enjoy cooperative games I would definitely recommend this experience. If you are curious you might want to check out the app which was recently released (I have not had the opportunity to play it yet). As a bonus I am including a Spotify playlist to provide ambience for your Burgle Bros adventures.